Just a quick post for the parents out there craving information and logistics. As a parent I'm the same way and when my kids are away I want to know everything about what they did, what they ate, and anything else I can find out. Our day started with our regular routine - breakfast and making lunch at 7:30 and then out the door by 8:30. All of our teams went to the same projects today except the Farm team who went to stack some wood for a family in Weston. We met back up at 12:30 for lunch at the town hall in Londonderry and then had thirty minutes of solo quiet time where the students are given a chance to journal, read, pray and just process everything they learned the night before. After solo time we split into church groups with the local Vermonters joining the Hope crew for a game and then a trip to the Vermont Country Store. The Storehouse group headed back to the Chester church for a bit then also went to the Vermont Country Store. Our afternoon evening project took us to Cavendish. We've been partnering with Cavendish Baptist Church for several years and tonight we helped them with a one night community VBS program along with a BBQ and projects for several of our teams. While a few groups helped setup for the VBS others went to a local baseball field and weeded, helped a family move furniture out of a house, unloaded lumber, and so much more. After projects our work crews joined the rest of the group back at the BBQ and had a great night interacting with families in Cavendish. 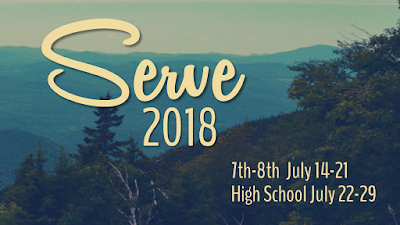 We made it back to Chester just in time for our 8:00 program to start and it's just finishing now with George Searfoss sharing a message about using our hands to serve others. In a few minutes these students will find their small groups and end their nights with those groups. It's been an incredible week so far - these students are so special and are thriving in community with one another. We've got morning projects tomorrow then a fun activity tomorrow afternoon. Pictures will be updated soon and maybe another blog from one of our other leaders this week.